Enabling you to simulate the unique appearance of different film types with your digital files, DxO's FilmPack 5 Elite Edition adds an element of analog photography to your digital workflow. Comprising more than 80 distinct film types, this software includes a variety of favorite black & white, color negative, and color positive films whose unique qualities and grain structures can be applied to digital images. Beyond applying the film profiles themselves, this software is also capable of processing raw image files, compensating for optical defects automatically, and minimizing digital noise in favor of simulated film grain. An array of traditionally-inspired creative effects can also be applied to imagery, including toning, filter effects, light leaks, and vignettes; each of which are fully controllable to create a personalized look. Offering some of the most beloved and distinct aspects of film photography within an efficient digital interface, FilmPack 5 allows you to re-enter the world of analog photography with the convenience and control of a digital workflow. Set within an intuitive interface, this program neatly organizes all creative effects, film renderings, and editing controls within reach and also incorporates a file browser for easy access to local and networked file folders. FilmPack 5 can function as both a standalone application or as a plug-in with popular editing programs from Adobe, Apple, and DxO. At the core of FilmPack 5 is a host of dedicated film profiles designed to replicate the unique qualities of more than 80 film types. Using a scientifically rigorous process, each film type has been profiled by shooting calibration targets and real subjects, developed by reputable film development labs, and then scanned at high resolution in order to accurately measure the distinct qualities of each film type in relation to response and grain patterns. Each of the color and black & white films can then be simulated using the software in order to mimic their grain, color, saturation, and contrast with your digital files. Grain intensity and density can be adjusted within each film type and, additionally, different film characteristics can be combined to create your own custom profiles. 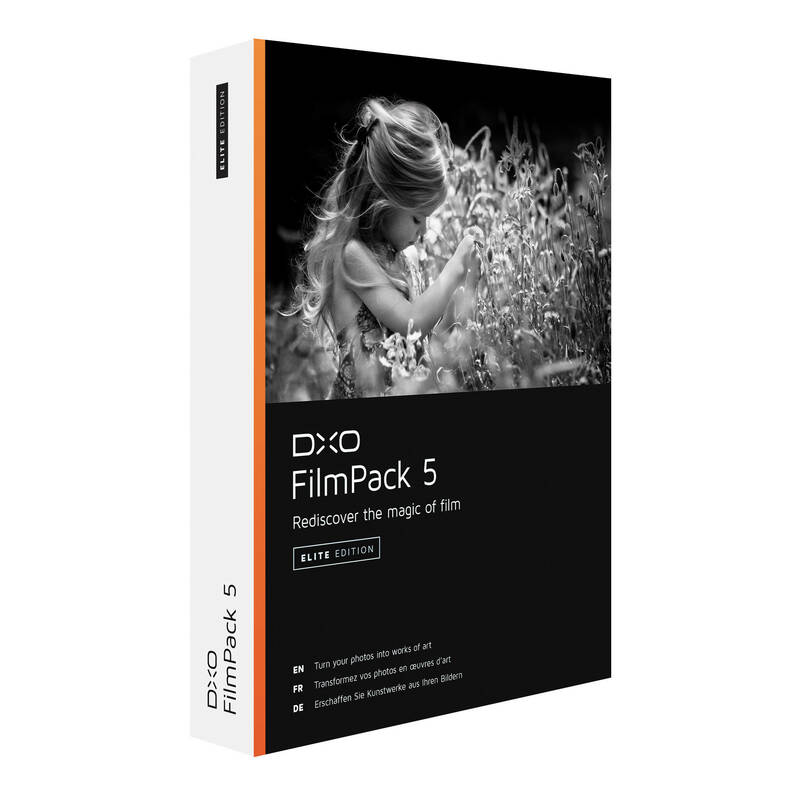 This Elite Edition of FilmPack 5 features 38 different black & white films, including Adox CHS 100 II, Adox CMS 20, Adox Silvermax 21, Bergger BRF 400 PLUS, Foma Fomapan 100 Classic, Foma Fomapan 100r, Foma Fomapan 200 Creative, Foma Fomapan 400 Action, Fujifilm Neopan 400, Ilford Pan 100, and Ilford Pan 400; 27 color positive films, including Fujifilm instax 210; and 17 color negative films, including Adox Color Implosion, Fujifilm Superia X-Tra 400, Fujifilm Fujicolor Pro 400H, and Kodak Portra 400. Additionally 39 Designer Renderings have been included, to simulate different film-based effects, and there is also the ability to customize your own renderings for personal effects. Support for raw image files helps to garner the truest results in relation to the different film types available. By utilizing all of the image data from capture, the software can restore colors and efficiently process files, including the ability to reduce image noise and apply authentic film grain effects. Additionally, any optical defects from capture-including distortion, vignetting, and chromatic aberrations-can be automatically corrected, too. Beyond applying the distinct looks of different film types to your digital files, you can also simulate traditional processing effects to further modify the look of your photographs. Vintage effects and tints can be applied, as well as several filter effects, vignetting, blur vignetting, and a variety of textures, light leaks, and image frames can also be added. Additionally, toning allows you to replicate a common darkroom process to affect the final appearance of an image, and split toning control can be used to independently adjust the look of both highlight and shadow regions. Particularly beneficial to black & white imagery, control over micro-contrast allows you to add a more dramatic look to imagery by adjusting how details and tones are perceived. A revised Blur tool offers a dedicated Soft Focus mode to produce an artistic, dreamy image quality that is well-suited to portraiture. An intuitive interface design presents all of the controls within easy reach, with the ability to apply different effects using a single click. For more advanced control over the look of effects, different settings, including vibrancy and a channel mixer, can be used to fine-tune an image's appearance. Benefitting an efficient workflow, snapshots, saving of favorite presets, and a built-in print dialogue are all incorporated within FilmPack. The program is configured within a 16:9 aspect ratio to offer greater room for working when used on widescreen monitors. Different renderings, effects, and settings have been grouped together within the menu system for faster access to different tools. Batch processing allows you to consistently apply effects to groups of imagery. Different customized renderings can be imported and exported. Snapshots allow you to record the state of your image during the course of editing for easier side-by-side evaluation and re-applying of different techniques and processes. An integrated file browser allows you to view and select photographs from within the application. FilmPack 5 can function as a standalone application or as a plug-in for Adobe Photoshop, Photoshop Elements, Photoshop Lightroom, Apple Aperture, or DxO OpticsPro. Box Dimensions (LxWxH) 7.402 x 5.591 x 1.024"
FilmPack 5 Elite Edition (DVD) is rated 4.7 out of 5 by 7. Rated 5 out of 5 by David T. from Outstanding Color Management I edit my raw files using FP5, OpticsPro 11, and Lightroom 6. I first make basic edits using OP11 (crop, straighten, use OP11's Smart Lighting, and ClearView modules, sharpen, and reduce noise). I then use FP5 for color rendering. FP5 offers 18 color positive and 16 color negative virtual color film renderings to choose from. For each film type, a slider allows you to adjust the intensity. In addition, there are 18 color filters available. These function in the same way that a color gel placed over the camera's lens would function. For each filter, a slider is available to adjust the density of the color. There are also 38 virtual b&w films available. Finally, there are a variety of special effects available, which can be used to manipulate the image to look like a print photograph. After I'm finished with FP5, I export the image to LR6 for further tine-tuning. Taken together, OP11, FP5, and LR provide a system for outstanding color management (as well as halftone management). Rated 5 out of 5 by Nick from Great for Digital Photographers I haven't used film for many years. I love digital and this program allows you to get the film look without the need to develop rolls of film. I use this to give my photos a quality look and feel. Nothing negative to report on this program. Rated 4 out of 5 by C8Imager from Pretty much as advertised DXO Film Pack 5 does what it says it will do. There are good adjustment tools for customizing the results. However, the program readily throws away extended highlight and shadow detail, so working with a pre-processed version of a file might be required to retain dynamic range information at the extremes. The program is generally easy to navigate, but there are a few quirks and it is slow. Rated 4 out of 5 by arh73 from Great Software - Terrible Interface This is one of the best film emulation software packages available, it produces great results and has many fantastic pre-sets. However it is let down by a terrible user interface when used on a Macbook Pro. It's better on a 27 iMac. Rated 5 out of 5 by Manoj M. from Wow!! Makes my fake looking digital images look like film!! Some are just breath taking and look like the real thing. All I have to say is the colors and the greyscale shades!!!!!!!!!!! Rated 5 out of 5 by Thorcat from Great addition to silver effects You get a ton of ways to get great B/W prints and a lot os frames to add to your photos. Rated 5 out of 5 by Soma from Great pho software! Easy and great results! Does this software ONLY work with RAW files and not JPEG? It works with JPEG as well.